Staff Photo by Dan Henry / The Chattanooga Times Free Press- 3/7/16. Kelsey and Landon Welch check rent bikes from the Chattanooga Bicycle Transit System kiosk near the Aquarium on Monday, March 7, 2016. Get information about the new app at www.bikechattanooga.com. Staff Photo by Dan Henry / The Chattanooga Times Free Press- 3/7/16. 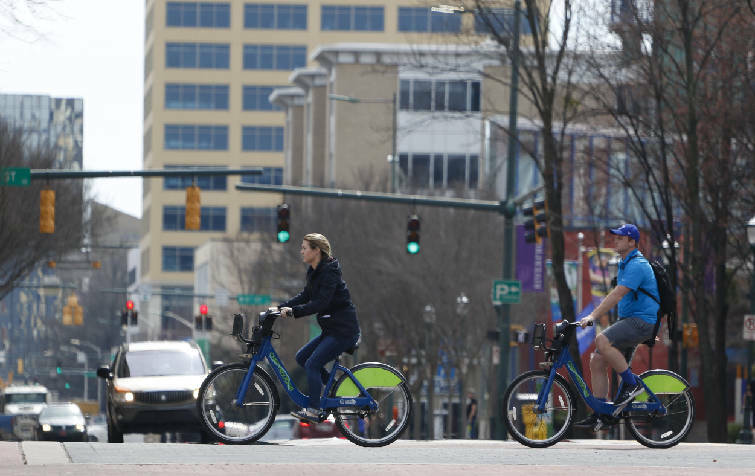 Kelsey and Landon Welch cross the intersection of W. Aquarium Way and Chestnut St. while using rental bikes from the Chattanooga Bicycle Transit System kiosk on Monday, March 7, 2016. 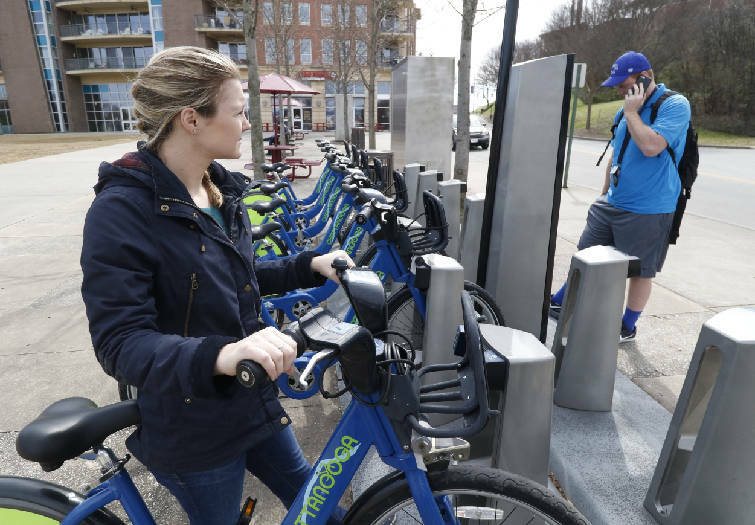 Checking out a bike through the city's bike-share program got a little easier last week when Bike Chattanooga launched a partnership with the Transit smartphone app. Soon, there may be new bikes to ride, too. PBSC Urban Solutions, the provider of the 300 bikes in the city's program, unveiled two new bicycle models last month that are expected to start making their way to the company's partner cities over the next year. 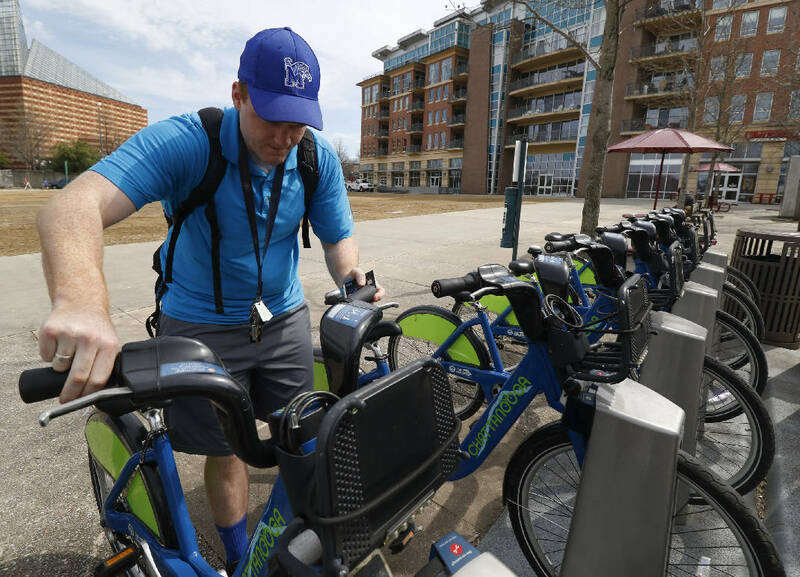 There is no plan in place yet to bring the Fit and Boost bikes to Chattanooga's 33 bike rental stations, but city assistant transportation engineer Ben Taylor is exploring ways to pay for the new options. The Fit is a smaller, lighter bike than the standard option, while the Boost is an electric model that can lighten a rider's workload as they pedal through town and up hills. "I haven't gotten a cost back yet on how much those bikes will be, but we'll need funds to bring them here," Taylor said. "These will be interesting bikes, and hopefully someone will want to see them here and sponsor it." Just as companies advertise on city buses, they can have a bike wrapped in their colors with their name and logo. There are five bikes in the bike-share system now adorned with the University of Tennessee at Chattanooga colors, nickname and logo. "Having a new style bike at the stations will draw attention," Taylor said. "We've found the biggest hurdle is getting people to take that first ride, and once they do, they'll come back more and more." PBSC announced the new bikes on Feb. 26 at the Velo-City world cycling conference in Taipei, Taiwan. "Today, we take immense pride in introducing a new line of products that will meet the most demanding needs of our consumers while offering highly innovative solutions to the ever-growing challenges that urban mobility presents in small and large cities alike," PBSC president and chief operating officer Luc Sabbatini said in a news release announcing the bikes. PBSC also partnered with the Transit app to give cities a mobile rental option for their bike-share systems. Chattanooga jumped in with the system early, and smartphone users can now reserve bikes through the app. "It's great for everybody. It definitely has a benefit for people who are new to the system," Taylor said. "They'll see where the stations are and where bikes are available if they just pull up the app. They can go through the screens on the transit app itself to reserve the bike without having to go through the kiosk screen at a station." The app also shows other public transportation options and eliminates the need to interact with the kiosks at a rental station. Participants in the program's annual membership can use the service, too, and Taylor hopes it will drive ridership up. "We're looking forward to the warm weather," he said. "We've seen our numbers getting bigger every day as it gets warmer."